Blue Rock loves books. We have been reading to him since the day we brought him home from the hospital. A nurse gave me some advice, she said, "when you are feeding him, read to him." I did this quite a bit, but only during daytime feedings. Now we typically read to him 30 min. to an hour a day. There are a number of books Blue Rock has memorized. The ones I can think of off the top of my head are: Are You My Mother? ; Goodnight Moon; Old Hat New Hat; Goodnight Gorilla; and Bless Me. He actually "read" Are You My Mother to my step-mother when we were in Texas a few months ago. She was quite impressed as he was very dramatic as he read. Blue Rock is starting to sound out words and he knows quite a few. However, he doesn't usually see a word and tell us what it is unless it's his name, which he knows very well. Numbers and letters are a different story. He started pointing out letters when he was 17 months old. We first noticed this when we went to dinner in Mannheim one evening and he was pointing and saying the letters on random signs. Last night was different. While we were eating dinner, Blue Rock read his first word, out of context, that was not his name. He seems to know a lot of words but usually tells us them when we're reading a book. Or if he sees his name written somewhere, he is quick to point it out. Last night was different. He noticed one of his trucks on the floor near the wall. He said, "I would like that cat, please." My husband and I looked at each other then looked to where he was looking to see if his stuffed cat was over there. 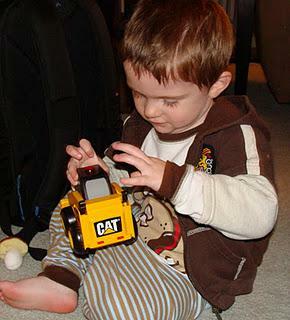 There was only one thing, his Caterpillar truck that says, "CAT" on the back, which was facing the table. It was solely lying on the floor near the wall. Neither my husband nor I have ever called one of his trucks a cat or caterpillar and he knows what a truck and a cat are. He also usually calls his trucks, trucks. We were both amazed. Reading is such an important part of life and we are glad he loves books and learning.